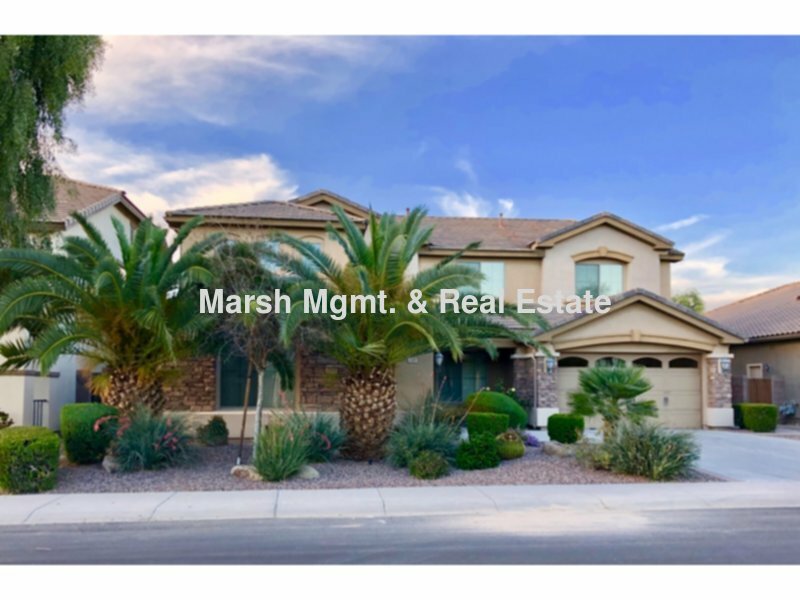 Residential Rental Listing 5 bed 4 bath in Gilbert, AZ. Beautiful 2-story 5 bedroom home with fenced pool & spa in Gilbert! beautiful 2-story 5 bedroom home with fenced pool & spa in gilbert! Greenfield & Queen Creek ~ South on Greenfield, east on South Freeman Farms Road, right on Quinn Ave, right on Ficus. Beautiful 2-story home with lots of upgrades! 5 bedrooms (1 bedroom & full bath downstairs), 4 baths, living room with dining area, dining room/den/office, large loft area, deck off master bedroom, family room with built-ins, eat-in kitchen with breakfast bar & pantry, all appliances (gas stove & gas dryer), upgraded cabinets with granite counters, lots of tile, neutral color carpet, huge master bath & walk-in closet, backyard is great for entertaining with BBQ area, fenced pool & spa, artificial grass & desert landscaping and 3 car garage. Pool service is included. No smoking please. Sales tax will apply to monthly rent. Security deposit will equal at least one month's rent. Tenants must provided proof of renter's insurance prior to moving in. 1 small dog may be approved. Please call regarding pets. Please refer to Policies on Renting for important information & qualifications. Smoking is not allowed in any of our properties. Sales tax may apply to monthly rent. Security deposit my equal at least one month's rent. Please call regarding pets. Please refer to Policies on Renting for important information.